Dvorah Chen heads her own law office in Israe, specializes in Criminal Law, Defense and Homeland Security issues. She began her legal career in the Criminal Division of the Tel Aviv District Attorney’s Office in 1976 where she rose from the position of a newly qualified prosecutor to the second in command to the District Attorney. In 1996, she was appointed Director of the Department of Security Matters and Special Affairs for the State Attorney’s Office in Israel’s Ministry of Justice. She retired at the end of the 2004 season. She is a Research Fellow at the Institute for Counter-Terrorism (ICT) at the Interdisciplinary Center (IDC) in Herzliya, and was a visiting Research Fellow at the Washington Institute for Near East Policy in Washington D.C in 2007. Presently, she is a Director on the Board of Directors, Israel Aerospace Industries (IAI). 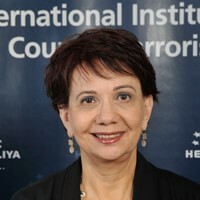 She served in other public positions, such as: Director on the board of The Israel Electric Corp. April 2010 – March 2013, Commissioner, the Board of Governors of the Israel Securities Authority (2007-2009); Member of the Prime Minister’s Advisory Committee on the Protection of Public Figures (2009-2011); Creator and master of ceremonies of a TV program on the Knesset Channel which deals with legal issues (2007-2012). During 2005-2008, she lectured regularly at Tel Aviv University on Legal Aspects of the State National Security. Dvorah Chen has an M.A in Public Administration from the University of Haifa, and an L.L.B from the School of Law, Tel Aviv University.